It’s that time of the month again! My Rubybox arrived last week and after seeing some of the ‘spoilers’ on the Rubybox Facebook page, I had a sneaky suspicion we would receive a mascara in this month’s Rubybox. And I was right! What is Rubybox? Rubybox is South Africa’s top beauty box subscription, where subscribers pay R 119,00 per month to have a bespoke box of 4 – 5 trial-size beauty products delivered to their doorsteps, giving members the opportunity to try products before buying the full-size version. Although the contents of the box are always a surprise, the products arematched to the beauty profile you fill out, so you receive goods that are best suited to your beauty needs. With a minimum monthly value of R 200,00 the subscription includes free delivery to your home or work by the 15th of each month. The RubyRands loyalty program lets Rubies earn points by reviewing products, completing surveys and shopping online, which they can redeem when they shop in the Rubybox online beauty store. This month’s Rubybox is, however, valued at over R 250,00! I received 1 full-sized product and 3 generous sample-sized products. I have used the John Frieda Frizz-Ease products in the past but have never tried this one. These are for use on dry, damaged and overworked hair (hair that is frequently coloured, highlighted and heat styled) & is enriched with Inca Inchi Oil (rich in Omega-3) to restore and reverse the look and feel of damaged hair. I haven’t tried these yet, so I have no idea whether they deliver on what they’re supposed to do. I will let you guys know once I’ve used these a couple of times to see whether there is a noticeable difference in my hair. We received 2 generous samples containing 50ml of product each! Full-sized value: R 99,00. I have mixed feelings about this one. If you look at the value of this mascara, it should be comparable to a Maybelline or Revlon mascara. I have used this mascara a couple of times and to be honest, it’s not the best mascara I have ever used. Rubybox says: ‘Get fatter lashes instantly with this volume-boosting mascara. The creamy, buildable formula allows you to customise your look, whether it’s thick and lustrous during the day or dramatic and glamorous after dark.’ I’m sorry to report that this mascara is neither creamy, nor volume-boosting. If you’re looking for a mascara that gives you natural-looking lashes and hardly transfers product to the lashes, then this is for you. I like my mascaras to be creamy (but not too thick) as I like long, defined lashes rather than thick, voluminous lashes. I’m sorry, Rubies, but this one did not impress me. Value: R 139,95 (available in the Rubybox online shop). If you have a problem with applying your mascara and it smudges onto either your eyelid or socket bone area, then this is for you! 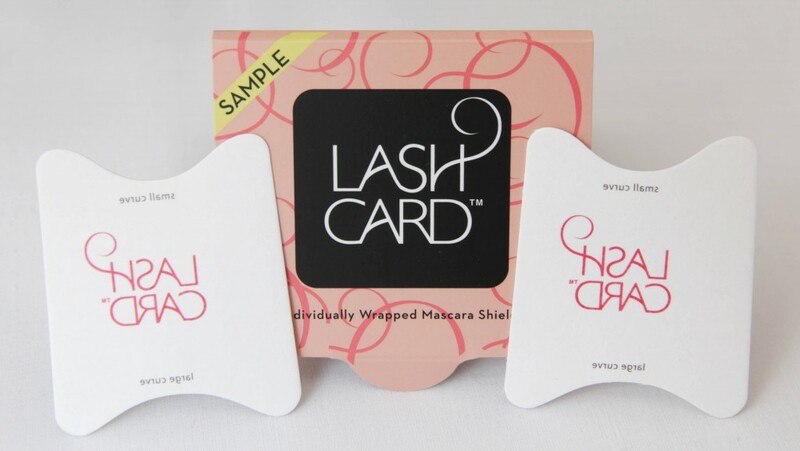 It’s a disposable mascara shield that helps prevent mascara clumping and smudging. 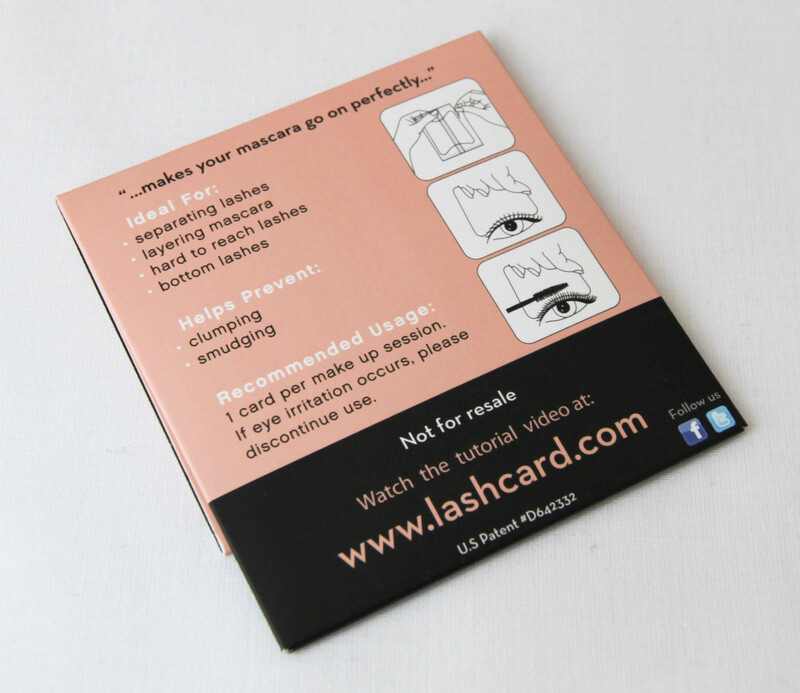 The card is shaped to cover your eyelids, but slim enough to get into the corners of the eyes. You simply press the Lash Card to the base of the eyelids, and apply your mascara as per normal. I, personally, do not have this issue when I apply my mascara but I am going to try this little nifty gadget for my under eye area when I apply mascara to my lower lashes. Full-sized (pack of 10) value: R 69,95 (available in the Rubybox online shop). Good news! All new August subscribers will receive a R 100,00 voucher in their Rubybox to spend on a selection of full-sized products in the online Rubybox beauty store. Thanks for sending me this box, Rubies! Thanks for the review, always enjoy reading your blog! I guess one could try to make your own – I’ve heard some makeup artists also use credit cards! CREDIT CARDS! Gosh! Who has so many cards they can afford to cut them up for their eyes??? Thank you so much for this review. I was searching all over for Rubybox reviews to find out what I had missed this month. It was the first month in a very long time that I did not get one. I wrote a post linking all the reviews I could find, and included yours.